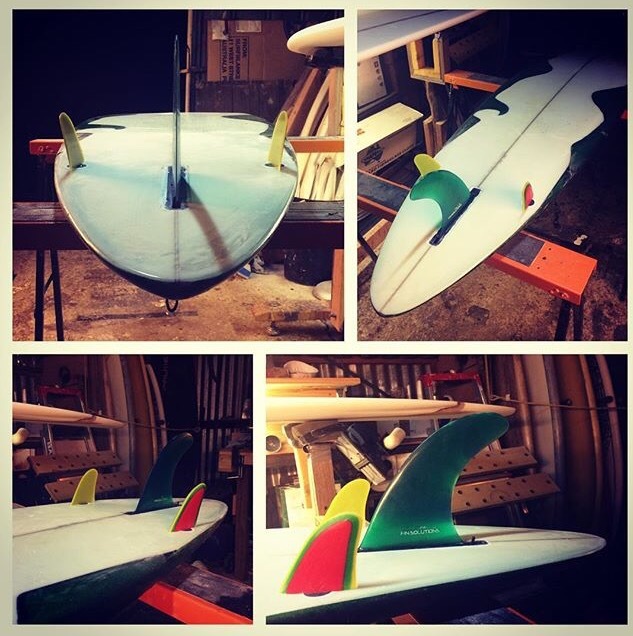 All my thoughts on the shaping process, including progress reports on boards and fins in production. I recently added a pair of single tabs to this ageing board so I could ride it as a 1+2, thanks to these little tri-colours given to me by Ben Chipper. It’s a great board to ride, but I’d found that it lacked hold in steeper waves. The side bites are intended to rectify this situation. Yesterday I took it out for testing in what turned out to be some reasonably serious waves – overhead to almost double overhead on the biggest sets. At first I found it difficult, as if the new fins had added hold, but at the expense of speed. I wasn’t making it past the curl, but if I did, I was struggling to turn it back into the power source and was left bogged and cursing as the wave ran away from me. Then one simple thing happened that changed my whole perspective – I changed where I was surfing. Instead of chasing the more elusive right-handers down towards the middle of the beach, I paddled back up to the point and sat on a left where only the biggest sets were breaking, and almost all the waves were lefts. Being a natural footer, this meant I was now on my backhand, so this, in combination with the size of the waves, resulted in a significant downgrading of my expectations of what I might be able to achieve. Effectively, I reset my whole outlook on the session and went back to basics. Find the right wave, paddle into position, turn, paddle, stand, make the drop, bottom turn, find the power source then drive down the line and pull off. Nothing fancy, but it allowed me to really concentrate on the board under my feet and how the new fin setup responded to small, subtle prompts. An average surf turned into a great one. I didn’t always make the waves, but it didn’t matter. There was nobody else on the peak, so I had my choice of waves and there was no pressure. I caught a few waves yesterday that I would normally not have had the courage or confidence to catch in the past, given their size. But I was so caught up in this perspective shift that I didn’t even think twice. The whole experience brings to mind a passage from Andrew Kidman’s book, Lost in the Ether (it came with the film), in which iconic Aussie surfer/shaper Terry Fitzgerald describes his approach to finding his rhythm on a new board.